Are you looking for flatware sets for home using, travel camping picnic, or a party? These 16 pieces unique table rust proof nicely home flatware set is made of China Asian stainless steel with mirror polished, can serve 4 people, sturdy & durable, suitable for daily serving use at home, restaurants or hotel. Simple & elegant appearance can easily match with all your existing tableware, adding much fun to your dining experience. If you want to go out to have a picnic with your friends or family, just carry this large luxury case of tableware is enough, useful and convenient. 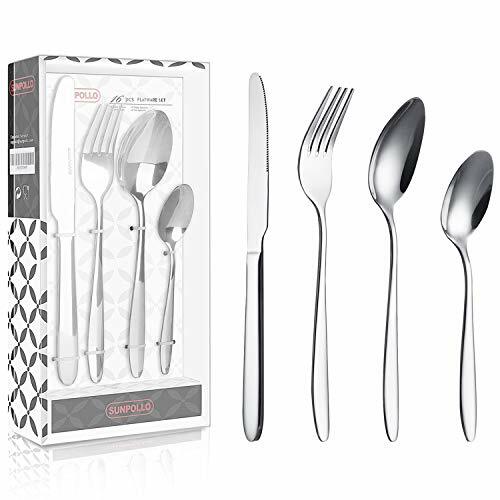 These 16 pieces flatware sets comes with an exquisite gift box, which can be an ideal gift for a housewarming party, or Mother's Day individual gift for your mom. Note: the cutlery set is dishwasher safe; you can clean it with dishwasher. 【Mirror Polished Silverware Sets】: Luxury mirror polished process requires no re-polishing, will not dull and holds its sheen, easy to maintain. If you have any questions about this product by SUNPOLLO, contact us by completing and submitting the form below. If you are looking for a specif part number, please include it with your message.